Graduation Banner Order Form | Key Blue Prints, Inc. Please select at least ( 3-5 ) business days out from your your order day. After you submit your order. You will receive a confirmation email that your order has been processed within 1-2 business days. If their are any issues with the order form or files submitted, a Key team member will email or call to resolve the issue as soon as possible. 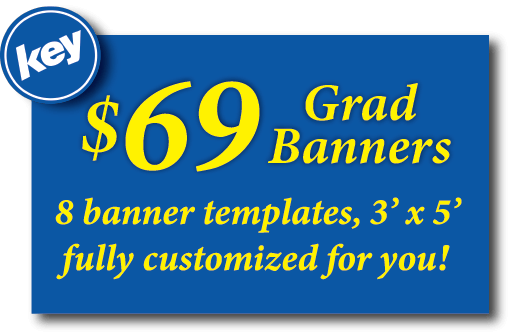 We will send a proof of your personalized grad banner in 2-3 business days over email. If approved we will start printing your grad banner! Payment will be accepted upon pickup. Please contact for instruction on how to send larger file sizes. Have additional questions? Need help ordering? No Problem!